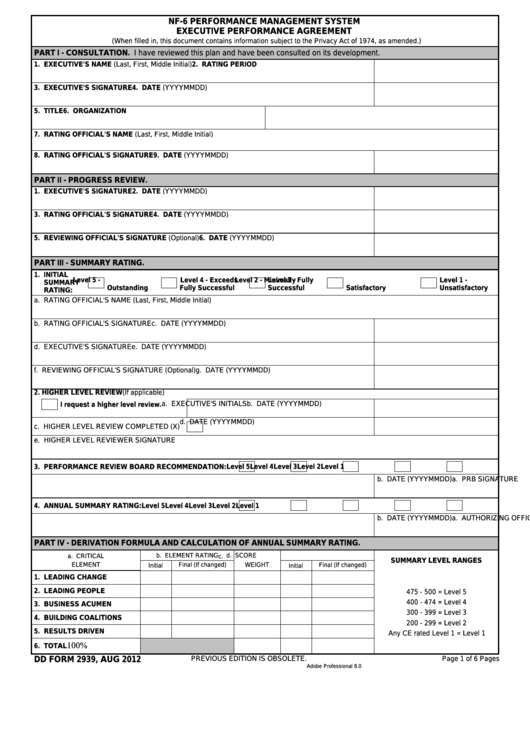 Download a blank fillable Dd Form 2939 - Nf-6 Performance Management System Executive Performance Agreement in PDF format just by clicking the "DOWNLOAD PDF" button. Complete Dd Form 2939 - Nf-6 Performance Management System Executive Performance Agreement with your personal data - all interactive fields are highlighted in places where you should type, access drop-down lists or select multiple-choice options. PART I - CONSULTATION. I have reviewed this plan and have been consulted on its development. PART II - PROGRESS REVIEW. PART III - SUMMARY RATING. I request a higher level review. PART IV - DERIVATION FORMULA AND CALCULATION OF ANNUAL SUMMARY RATING.